This year we are placing the focus on the incredible Blues talent that resides in the Rose City, along with a few guests from the international community. Norman “The Boogie Cat” Sylvester was born in Bonita Louisiana September 16, 1945. He and his family boarded a Union Pacific Train for work in the Northwest in the Fall of 1957 when he was 12 years old, but his family’s Southern Traditions have never left him. The Boogie Cat is totally dedicated to soul healing force of Music. Norman is a “family and community first” musician. He has mentored many young talents in our area, Patrick Lamb, Gretchen Mitchell, Jolie Clausen, Joseph Konty, Alden Harris and Gunnar Roads to name a few. He teaches through grants and Ethos “A History of American Music” in our local schools. Sylvester and his band also use their power of music to perform for many benefits, charities and individuals in need. Norman Sylvester “The Boogie Cat” was Inducted into the Oregon Music Hall Of Fame on October 8, 2011 at the Newmark Theater in Portland Oregon. This honor has given the Boogie Cat a new surge of energy. Norman is one of the most engaging showmen around the Northwest. Influenced from his Southern Baptist early years and the Gospel Quartet his father, Mack Sylvester, toured with (they were as sharp with their fashion as they were in their harmonies), these examples show in Sylvester’s own performance. There is the work for the paycheck and the work for your passion. Norman’s music is most definitely his passion! The Boogie Cat has paid his dues and now he is living his dreams. LaRhonda is the 2017 and 2016 Muddy Award winner for Best Female Vocalist presented by the Cascade Blues Association. LaRhonda Steele began her musical journey in Jones, Oklahoma at age 13 singing her first solo in church one Sunday morning. Her journey continued to Portland, Oregon Porretta Italy and beyond culminating into an powerful legacy of musical experiences. Over the years she has enjoyed working with local, national and international artists including Curtis Salgado, Norman Sylvester, Janice Marie Scroggins and Gino Vannelli. Performing in Porretta Italy at the 30th annual Porretta Soul Festival that honors American Soul Music, the Lincoln Center with Obo Addy in 2005 and her yearly appearances at the Safeway Waterfront Blues Festivals are just a few of the highlights of her career. LaRhonda currently enjoys Directing the Portland Interfaith Gospel Choir, working with B3 organist “King Louis” Pain. Their CD “Rock me Baby” received 4 out of 5 stars in Downbeat Magazine and is currently being played throughout Europe. She also enjoys working with her own band The LaRhonda Steele Band in which her husband Mark is the keyboardist and co-producer of their collaboration “Artistic Differences.” The CD features 12 original songs written and co-written by the duo. Her CD “My Soul’s Song” features some of her gospel favorites..
Dante Zapata has been playing and performing since childhood. He was born and raised in McMinnville, OR, the heart of pinot noir country. Dante now resides in the ever growing city of Portland, OR. He is first and foremost a Blues and Soul musician, but he's also known for playing anything from folk to gospel to reggae. When Dante is not performing, he regularly enjoys dancing, drumming, and creating. "I grew up playing and listening to music with my family. The love of music and the arts run in my family. Only a few are performers but mostly all are creators in one way or another. " Dante has been performing in Oregon's wine culture for nearly a decade. "I wandered into a local wine bar when I was first wanting to perform. I told them I played nice soul music and I played the server a song. They hired me to play, that was my first wine gig. From there I was meeting all kinds of people in the wine industry and playing in more wine bars and wineries than I could keep track of. I feel very lucky and thankful to be a part of this culture." Being a talented dancer, this gifted, young musician has also gained a powerful reputation in the Blues Dance community's across the country. "For the past few years I've had more opportunities in music than I ever thought possible for myself. I've officially become an international musician. I've done shows in France and Switzerland, I've done shows in Seattle, California, Colorado, Tennessee, and New York. I love music and performing, It’s what I was born to do." Dan has performed extensively in the USA, both with contemporary blues players and as a solo act. He gravitated towards the deep South in early 2007 whilst making a documentary on the history of blues and has since spent 16 weeks playing around the Mississippi Delta and surrounding areas. During his travels, he met and interviewed blues legends David ‘Honeyboy’ Edwards, Henry Gray and Hubert Sumlin as well as members of both Robert Johnson and Muddy Waters’ family. Recently, Dan has developed a strong following among blues dancers seeking to re-create the juke-joint style experience of the 1920s-1950s. He plays regularly for blues dancers in London. Born in Virginia, his mixed race and mixed culture background exposed him to the blues and the folk music of his Mother. Since the young age of 12, Tevis has been inspired to bring the old traditions to life for a true blues experience as he channels his heritage. While accenting his own original flare and interpretations, Tevis executes an authentic performance whether it be a cover or an original. As an artist, he is more than a re-vision-er of yesterday, he is a fresh contributor to today. After moving to Portland Oregon in 2003 where he still resides, he has experienced a meaningful career opening for acts such as Robert Cray, and performing onstage with Peter Yarrow (of Peter, Paul & Mary,) Baby Gramps, Mary Flower, Norman Sylvester, Bill Rhoads, Ural Thomas and Suburban Slim to name a few. Tevis placed as a solo semi-finalist in the 2014 International Blues Challenge, and he has had great reception at festivals and venues alike. Kenneth has been spinning tunes for well over a decade, creating breakdance mixes from his dad's vinyl collection to DJing hip hop / break competitions in college. After falling in love with blues in 2014, he’s spent the past few years learning and diving into the wide variety of blues styles and history. 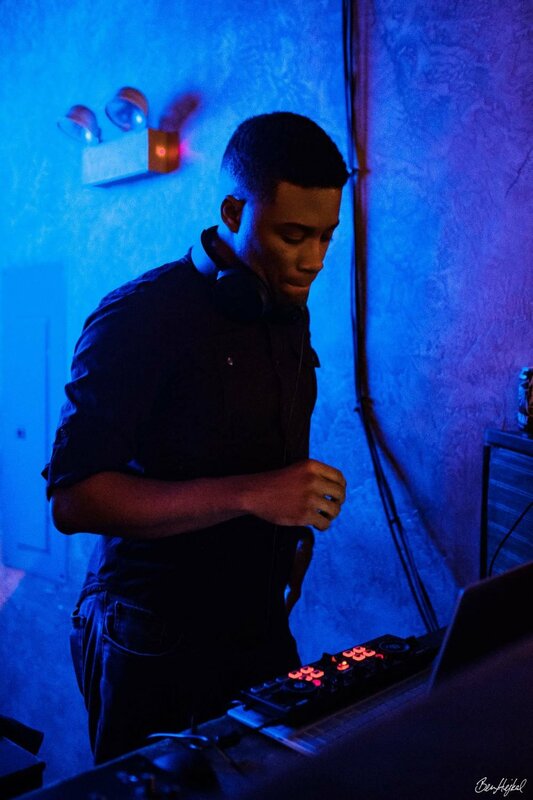 Kenneth aims to get you grooving and moving every time you step out onto the dance floor. He loves playing with your faves while also showcasing the soul/blues legends from his hometown of Nashville and his new home of St. Louis. After an eight-year hiatus, Ben once again hails from Portland, Oregon. It’s also where he first began DJing: Tuesday Blues in 2006. He’s DJed all over the country since starting out those twelve years ago, from local venues to national events. Wherever he goes, he is best known for playing those raw, melty Blues tracks late into the night. 9:00-10:00pm Live Music: Tevis Hodge Jr.
4:15am Sleepytime, see you on the dance floor tomorrow, all day and all night! 4:15am We aren’t done yet, see you in the ‘morrow to dance ‘till we drop! 4:00am Thank you and goodnight!